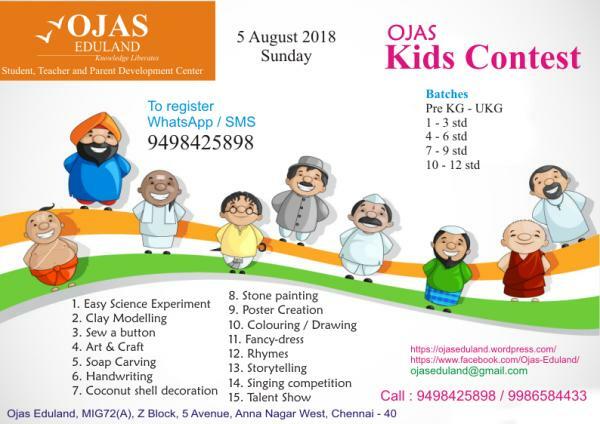 “Ojas Eduland” conducts Kid’s Competition on 5th August 2018, Sunday. Participants have to demonstrate any easy science experiment of their own choice. Topic : Participants have to make any national symbol like national flower or bird or tree, etc using any craft materials. Participants have to bring materials for art and craft. Participants have to bring the soap and other materials for carving. They can use any household things such as forks, spoons, toothpicks etc to make any design in the soap. Participants have to create the above said topic in pictorial form. Printed pictures or stickers or drawings or any art material can be used for poster creation. Topic : National animal tiger or national bird peacock. Participants have to bring Pen / Pencil / colouring materials. Printed picture will be provided for Pre.K.G to UKG students for colouring. Participants can wear any costume that represents Indian culture. i.e., they can dress like Hindu, Musalman, Christian or any regional and cultural representation, etc. Events conducted in various part of Anna Nagar, the event cost for per event is 50. Though this organization conduct event on various topics and cover all school pupil but have very high registeration cost. Does the organization, what the sudents to participate or just feel 5-10 members enough for all event category. How they will show interest to participate in multiple event? Even I won’t recommend to others due to high registeration fee.